Almost everyone is guilty of playing the blame game. It's satisfying and easy to do. If we despise our work, we can blame our manager or even our short-sighted organization for its inability to recognize our genius. If our personal lives are a disaster, we can blame our spouses, partners, the economy, or even our ancestors. We all know on some level that we are pointing our fingers in the wrong direction, but we just can't seem to help ourselves. 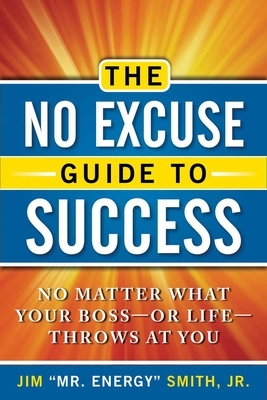 The No Excuse Guide to Success shows you how to abandon this unworkable routine and stop the destructive pattern of making excuses and blaming others--to stop whining and start winning. A sought-after trainer and personal power speaker for the past 15 years, Jim "Mr. Energy" Smith, Jr. has delivered his message that we have the power to radically change the direction of our lives to thousands of individuals throughout the world. Jim spent 16 years working in corporate and consulting leadership positions for a wide variety of industries. He currently serves as a faculty member for Rutgers University and is president and CEO of JimPACT Enterprises. Jim's previous motivational books include: From Average to Awesome: Lessons for Living an Extraordinary Life and The Masters of Success (coauthored with Ken Blanchard, Jack Canfield, and others). Jim lives in Mt. Laurel, New Jersey with his wife, daughter, and two sons.